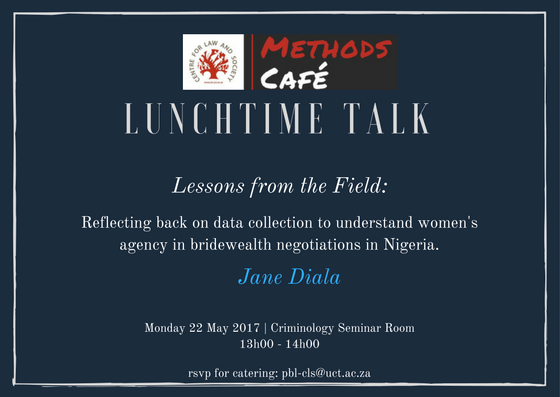 The CLS Methods Café hosts a lunchtime seminar during which a student or faculty member discusses a tricky methods/ethics problem. CLS sends out invitations advertising the methods seminar topic for the month. If you would like to be on our mailing list, or would like to present your own tricky methods question, please email Vitima Jere (vitima.jere@uct.ac.za). See here for more information. Melissa Meyer: I did a student survey and all I got was this lousy information! Ruth Nekura: My experience of empirical research: Never do it?